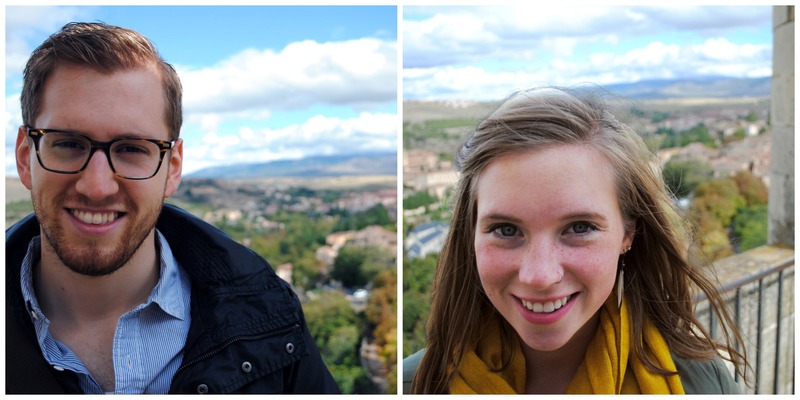 Shannon and I have officially passed the one month mark here in Spain. That is just enough time to start to get the hang of things around here. We have our work schedules down, we’ve figured out how to order food in a restaurant, and we know where to go when we need to buy something. With the basics of Spanish life covered, we decided it was time to start exploring. 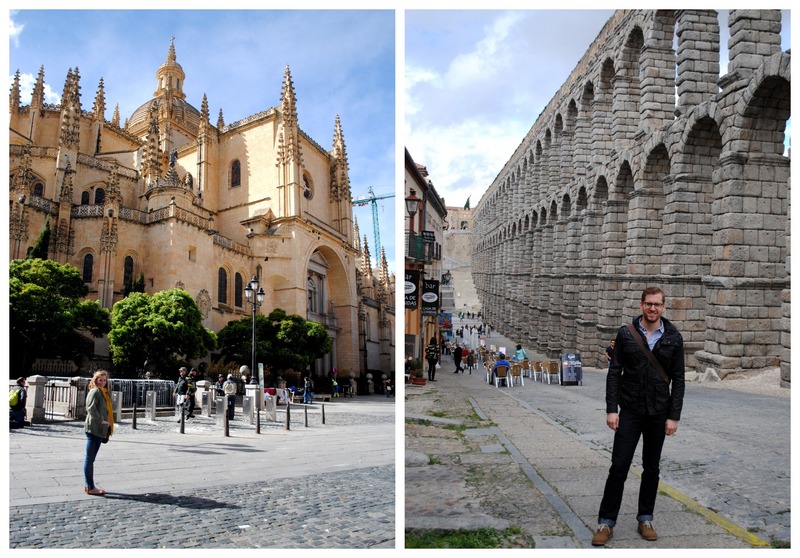 For our first trip, we decided to start small: Segovia, Spain. 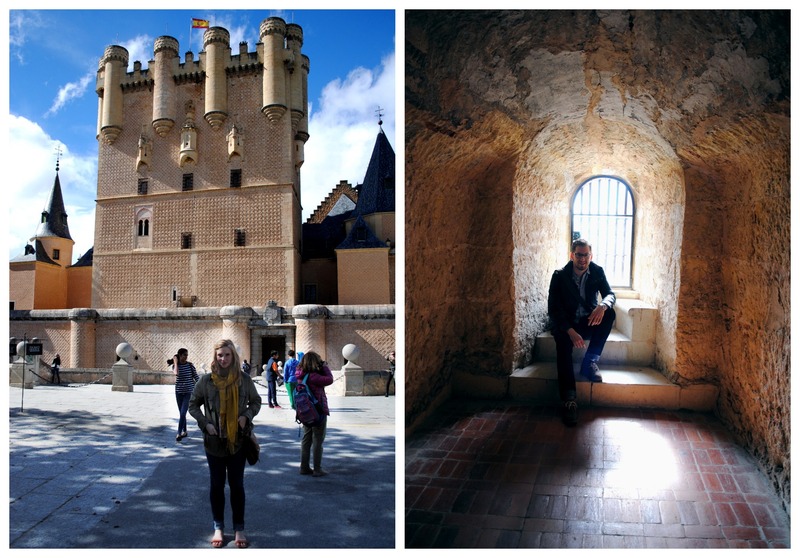 Its only about an hour bus ride from Madrid, so we thought it would be a good first traveling experience (you know, less opportunities to get lost). Segovia is a smaller Spanish city with lots of history. It has been around since Roman times, and at one time was the home of Isabel of Castile (do a wikipedia search). The biggest attractions in the city are the Aqueduct, the Alcazar, and the Cathedral. The city center is very walkable, so Shannon and I were able to visit all three sities. When I say walkable I still mean like 2 Kilometers between sites…I guess thats really dependent of your definition of walkable. The Aqueduct was very impressive. No one knows exactly how old it is, but about 1,500 years is the rough estimate they give. The whole structure was built without mortar and is held in place by precisely cut stone. It was really cool to see and touch something that was constructed way back when. Next stop was the Cathedral. We didn’t actually go in (because it cost money), but we walked around almost the entire thing. I’m no architect, but I’m pretty sure this church is an engineering marvel and a work of art, especially when you consider its age. Last stop was the Alcazar. While I’m not exactly sure what Alcazar means, I can tell you the structure is basically a castle. (Maybe Alcazar means castle? I don’t know, the dictionary is so far.) This was by far my favorite part. It looks like something straight out of a fairy tale, with a draw bridge and tower included. Shannon and I decided it would be fun to take a risk and climb the tower despite the tourism warning that it includes 152 steps and “is only for the healthy.” To get to the top, you have to go up several sets of staircases that are made of hand-cut stone and very narrow. The main staircase is cylindrical and you half expect to find a princess who has been locked away at the top. When you finally reach the top, there is an amazing, 360 degree view of the city and countryside (last picture). Overall, it was a great trip, and an awesome way to kick off a year of exploring!